Comments: The colloquial name of “fish hawk” is well deserved. No other raptor possesses greater skills or determination to capture fish. Their feet-first, crashing dives, sometimes taking them completely under the water, followed by lift-offs with a thrashing fish are spectacular to observe. They are uniquely adapted to this hunting style with dense, oily feathers, unusually long legs, highly curved talons and feet with bizarre, spiny pads that help grip slippery fish. 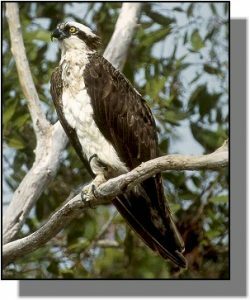 The osprey was one of those species critically threatened by pesticides during the DDT era of the 1950s. Distribution: Ospreys are found nearly worldwide. In North America, they breed throughout most of Alaska, Canada, the northwestern U.S. and along the coasts. They are not known to nest in Kansas but are seen along lakes, reservoirs and rivers during the spring migration in April and May and the fall migration from September to mid-November. Food: Ospreys feed almost exclusively by hovering and plunging feet-first after shallow fish. Unusual prey items may include snakes, frogs, turtles and ducklings.